Pesto! I’m OBSESSED. Also, this was my first time properly caramelizing an onion. It was delightful! Honestly, this recipe goes pretty thick on the pesto, because that’s the way I like it. So the flavor of the caramelized onion doesn’t shine through as strongly as it would if you were to reduce the amount of pesto sauce you mixed in with the rest of the ingredients. You can always experiment with that if you’d like the flavor of the onions and Swiss chard to be more pronounced. I am a sucker for the vibrant garlicky-ness of the pesto – it’s so perfect with farro, which is, in turn, the perfect pasta substitute. Cook farro according to package instructions (for me, this meant adding the farro and three cups of the water/broth to a medium-sized pot, bringing it to a boil, then covering it, reducing the heat to medium-low, and letting it cook for about 15 minutes). To caramelize the onion, melt the butter in a large frying pan set over medium-low heat. Add the chopped onion pieces and let them cook for about 35 minutes, stirring them every few minutes, so that they brown but don’t burn. Add more butter to the pan if they seem like they are starting to burn. Once the 35 minutes has passed, deglaze the onion slices by adding the remaining fourth of a cup of water or broth to the pan and mixing it in with them, letting them absorb the liquid. Remove from heat once finished. While the onion is caramelizing, add the grapeseed oil and Swiss chard to a pot over medium-high heat. Cook for five minutes, stirring occasionally. 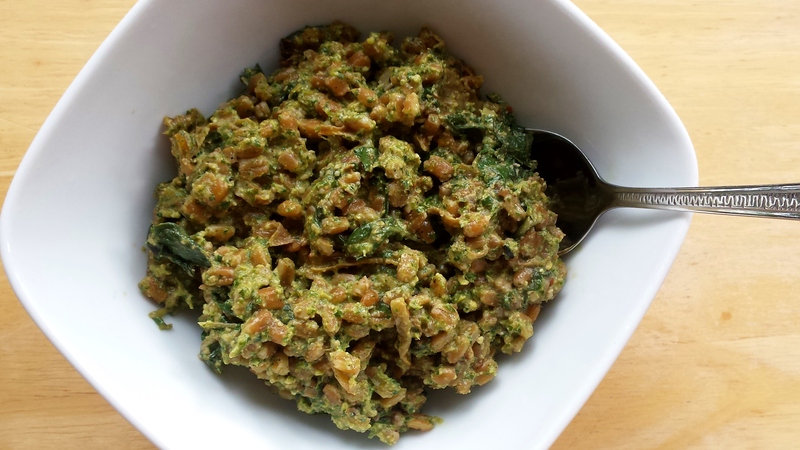 To create the pesto sauce, add all of the designated ingredients to a food processor or blender. Blend until a smooth, sauce-like consistency is achieved; this may take several minutes, and you may find it helpful to pause the food processor or blender and scrape the sides of it to get any ingredients stuck there that aren’t getting blended. Once the sauce is ready, blend well with the farro, caramelized onion, and Swiss chard. Success! Makes four servings.